We’re still waiting for our stuff to arrive by truck from Pittsburgh. These are mostly boat things and personal items, plus our bikes. And yes, we have too much stuff to fit on this boat without sinking it, but we had no idea when we started our search what kind of boat we’d end up with and what we’d need to outfit it for long-distance cruising. Without our big load of possessions we moved onto the boat with just what we’ve been traveling with: a few changes of clothing, our computers, some books, the compact eating-on-the-road kit we’ve used for four months, a guitar, and of course Izzy and the full cat equipment package. By the time we moved everything aboard and wandered around looking for the best places to stash things, it looked like we’d just about filled this thing up. The whole effect was enhanced by the fact that Danielle and Roger had apparently stocked the pantry with an eye toward another lap around the world. We think we can live off the food they left for months! What’s even better is that the foods are from many of the countries they visited on their trip, so rooting through the cupboard is like reading a travelogue. 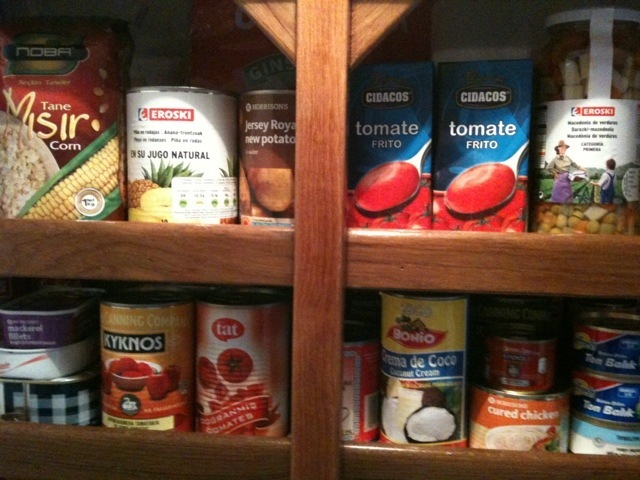 There’s honey from Australia, peas from Greece, tuna from Turkey. Good thing, too, since buying the boat put us on a beans and rice diet for a couple of months while our bank account recovers, and all these exotic goodies will keep us from dying of culinary boredom, not to mention remind us of the places we’ll see on our own journey. 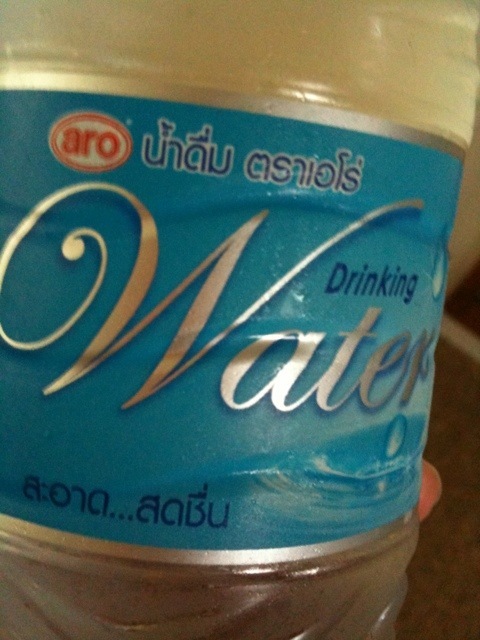 There’s a bottle of drinking water with a label in a language we don’t recognize. Can anyone tell us what it is? I’ll go out on a boom and say that the language is Thai. I’ve excluded Malaysian and Laotian because they both look dissimilar enough to what’s printed on the bottle. Could be Cambodian, though. But based on pure, unfounded speculation that more boats sail and linger on the much longer Thai coastline than Cambodian coastline, I’ll wager the bottle comes from Thailand. Btw, been following your adventures from the start, and want to say “Way to go!” So happy for you that you’ve found your new home! Ah, thanks, Tom. That makes sense that it would be Thailand. And thanks for the good wishes. We worked hard to get to this point and we can hardly believe we finally did it! Marce, we have that collapsible pet crate for you if you have room and/or need for it. I look forward to your next visit and will enjoy reading of your journey in the meantime. Have fun & stay safe!!! !